Over the past few years, the back of my mind has been thinking about a small, quick, camera robot I could drive around. Recently, with the help of a 3D printer I was finally able to print a chassis and put one together quickly. Once I had all the parts I could design a chassis for the robot. I took to Solidworks and designed a simple frame with the two motors in the middle, a battery on each end and the Arduino in the center. In the first (red) model I printed, the Arduino was orientated sideways, which made the width almost the same as the length. In the second (blue) design, I rotated the Ardunio so the robot was more long and skinny. Using a 3D printer let me change and test these things super quick! To control the motors I built a small board for the motor driver chip. There’s a good tutorial here for using the SN754410 chip. However it requires a 5V supply, so I needed to add a small 5V regulator in. The two LiPo batteries are connected in series, and nominally supply 7.4V to the 5V regulator and Vcc on the H-Bridge. 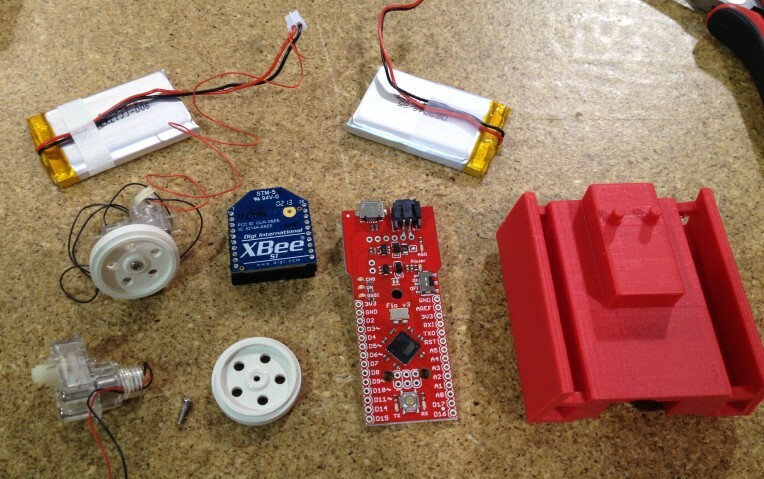 The Arduino Fio and Xbee run off only one of the batteries, as they require 3.3V. On the other side of the aether, I connected the second XBee to a USB to Serial board for the communication to/from a PC. I also used the thumb joystick I had and wired the X/Y outputs to two analog pins on the XBee. The following XBee config commands make the XBee sample the two analog input pins every 50 ms and send the values to the robot. The robot can then decode that information and use it to drive the motors. The SetMotor() function shown below combines the X and Y values from the thumbstick into left and right motor speeds. Before passing the thumbstick’s ADC values, they are divided by 4 and centered around zero. The extra resolution is not really needed and centering each around zero simplifies things. 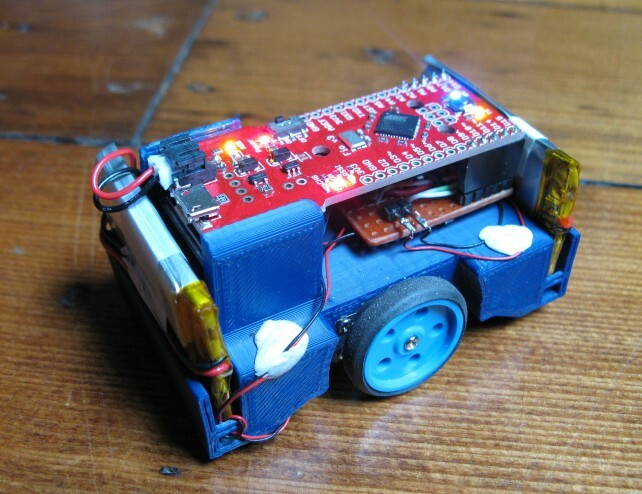 This entry was posted in 3D Printing, Robots and tagged 3d printing, arduino fio, robot, xbee. Bookmark the permalink.